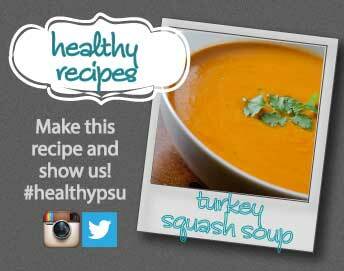 Get in the Thanksgiving mood with this Turkey and Squash Soup! Whether you’re looking for a turkey recipe to celebrate Thanksgiving in your own way or searching for a way to use up leftover turkey, this soup is a nutritious and delicious recipe to add to your favorites list. For vegetables, this recipe also contains squash, corn, and even leeks, which are rich in vitamin K.
Ready to give it a shot? We’d love to see your finished product. Upload a picture of your soup on Twitter or Instagram, and the best shot will become our new image for the blog! Use #healthypsu to enter. Add leeks and bell pepper. Cook, stirring often, until the vegetables begin to soften, 3 to 4 minutes. Add garlic and cook, stirring for 1 minute more. Stir in broth, squash, thyme and cumin; cover and bring to a boil. Reduce heat to medium-low and cook until the vegetables are tender, about 10 minutes. Did you try this recipe? Comment with any tips you may have for fellow cooks!